On this post, you can find a definition of an intended vessel clause on a bill of lading. Why letter of credit rules accept intended vessel clause as a discrepancy, and an example of an intended vessel discrepancy. There are two main types of bills of lading available on the market, in terms of shipment notations: “Received for shipment…” bill of lading and “Shipped … on board” bill of lading. If you want to understand, which type of bill of lading you have in your hand, please simply look at the right bottom or right top corner of the bill of lading. You will (most probably) see a small rectangular, which contains an abstract of contract of carriage. Please keep in mind that full details of the terms and conditions of the carriage will be placed on the back side of the bill of lading, of course, if it is not a blank-back or short form bill of lading. If the abstract of contract of carriage contains a phrase like “Shipped, in apparent good order and condition…“, then the bill of lading is a “Shipped … on board” bill of lading. Received for shipment bill of lading confirms that the carrier has taken charge of the goods. However, received for shipment bills of lading do not confirm that the container has been shipped on board a named vessel. As a result, these kind of bills of lading require an additional “shipped on board” notation. Because of the fact that the name of the actual vessel is not determined at the time of the issuance of the received for shipment bill of lading, the carrier may define the vessel as an “intended vessel“. Unfortunately, the letter of credit rules accept intended vessel notation as a discrepancy in the absence of an on board notation. The only way to get your payment from the issuing bank under letter of credit transaction is to make a discrepancy free presentation. So, you must understand what an intended vessel discrepancy is. 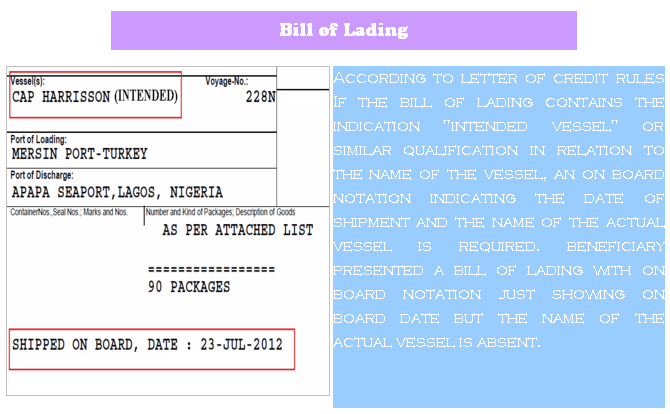 Why Intended Vessel Clause Inserted on the Bill of Lading? The actual vessel may not be determined when the carrier receives the goods from the shipper, especially in “Received for shipment” types of bills of lading. It has therefore become common practice to indicate the name of an intended vessel in the bill of lading, thus making it clear that a different vessel finally be selected. What the Letter of Credit Rules Say About Intended Vessel? Absence of such an on board notation will make the bill of lading discrepant. Field 46A: Documents Required: Full set of original bill of lading shipped on board marked freight collect made out to the order of Bank Millennium S.A, Poland notify applicant.